Facebook will have to radically change its privacy policies in Europe, or start paying millions of dollars a week in fines. A court in Belgium has ordered Facebook (FB) to stop tracking Internet users who are not registered with the social network. Once it has received an official translation of the ruling -- expected within the next two weeks -- Facebook has 48 hours to comply. If it ignores the court, the company will be fined 250,000 euros ($268,000) a day. Facebook said Wednesday it would appeal the decision, though doing so will not stop it from being liable to pay the fixed penalty. The company collects data of non-users who come into contact with its service -- by looking at public profiles or clicking the "Like" button. 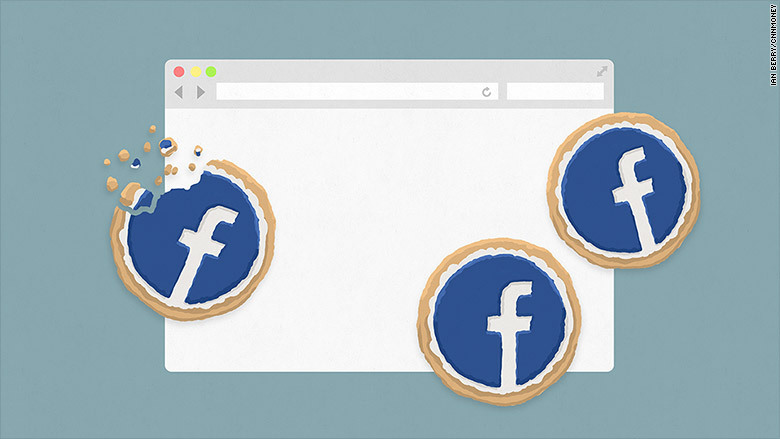 It traces people by dropping cookies on devices of Facebook users and non-users to record their visits, behavior and preferences. It then stores this data to use in tailoring advertising, for example. Belgium's privacy watchdog took Facebook to court, arguing that the company doesn't ask for the permission of non-users to gather this data. "The court has ruled that Facebook can not follow people on the Internet who are not members of Facebook, which is very logical. Since they aren't members, they can never have given permission to follow them," said Margot Neyskens, a spokeswoman for the Belgian government. Facebook argues it is collecting data for safety reasons, and that the court's decision will put its users in Belgium at greater risk of cyber attacks. "We use the datr cookie to help differentiate legitimate visits to our website from illegitimate ones," Alex Stamos, Facebook's chief security officer, wrote in a blog. He said that removing the cookies would force the network to treat any visit from Belgium with suspicion, and introduce additional verification steps. "It would mean a worse experience for people and less effective security for the Internet overall," he said. The ruling is the latest in a long list of regulatory headaches Facebook and other big U.S. tech companies face in Europe. -- Rob McLean contributed to this article.